A hearth from the copper age, wooden architectural structures from the Mauryan era, golden peepul leaves (probably used for rituals) from the Gupta period and a gigantic temple complex in a fortified citadel belonging to the Pala kings are some of the finds of the Archaeological Survey of India at Bangarh in South Dinajpur. The latest round of excavations at the site, described as a potential archaeological site by Sir Alexander Cunningham in 1879-80, have been on since 2008. “For the first time in north Bengal we have evidence of human activity and settlement from the Chalcolithic period (3rd Century BC in India) through pre-Mauryan, Mauryan, Sunga-Kushana, Gupta, post-Gupta, Pala and right up to the Sultanate (13th to 16th centuries) periods,” said Tapanjyoti Baidya, the superintendent archaeologist of ASI Calcutta, who headed the excavation team. The first scientific excavation at Bangarh was conducted by archaeologist and Sanskrit scholar K.G. Goswami, under the patronage of Shyamaprasad Mukherjee, then vice-chancellor of Calcutta University. He had uncovered a few brick walls probably from the Pala era (eighth to 12 centuries) and concluded from his study that there had been settlements at the site over many centuries from the Chalcolithic to the Sultanate periods. ASI’s recent excavation checked out Goswami’s hypothesis and was the first step towards charting the cultural sequence and settlement pattern of the site. The ASI will “now concentrate on uncovering the temple complex which is probably unparalleled in beauty and massiveness in Bengal’s temple architecture,” said Baidya. “Bangarh has several mentions in ancient literature. The Mahasthan inscriptions in Brahmi script of the 3rd century BC record that Bangarh was part of the Mauryan empire. Other documents like Vayupurana and Brihat Samhita mention that Kotivarsha or Bangarh was once the seat of the provincial governors of the Gupta kings. The 11th century Ramcharit by Sandhyakar Nandi affirms that Bangarh or Sonitpur was rich and glorious during the reign of the Palas. The prosperity is known to have continued till the Mughals took over,” said Baidya. The site can be divided into two areas: the citadel which is the main mound with a palace at the highest part (about eight metres from the road, which cannot be excavated as people live on it) and the city area where common people lived. The entire area was enclosed by a high brick wall (226 metres of it has been exposed) with evenly spaced semi-circular brick bastions (remains of nine have so far been found) that had slits for archers to shoot at enemies. A moat to make the fort even more inaccessible can still be seen around the area. The temple complex, which occupies a major part of the main mound, is only partially visible. Yet among the finds are decorative brick plaques, like the one of an archer that probably adorned the temple façade, and ritualistic pots bearing the stamp of artistic finesse. A wall and evidence of a few pillars of the congregational hall have also been unearthed. “It seems like a panchayatana temple (the main shrine is surrounded by four subsidiary shrines) with a circumbulatory pathway,” said Baidya. But close to this temple is a Buddhist Chaitya type structure with ritualistic pot-shards of red, black and grey ware, “throwing light on the different religious activities of the period,” said Baidya. Other finds include an inscribed gold ring and seals. From the Chalcolithic period are a hearth with charcoal traces inside, a copper bowl and an exquisite black and red ware dish, rods of copper, broken antimony and numerous pot shards which imply that there was a busy manufacturing centre. A Chalcedony bead and a boat-shaped mould are among the few finds from the pre-Mauryan era. From the Mauryan era there is ample evidence of wooden structural activities though the area has remained submerged in water over many centuries. The two polished wooden planks recovered are similar to the wooden planks found in Pataliputra from that era. 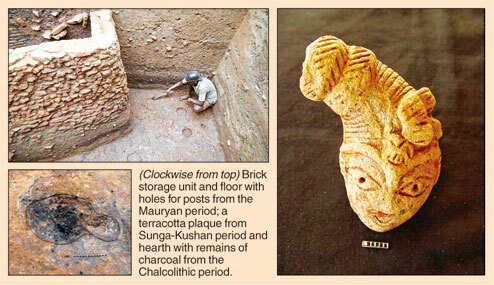 In Bengal these are the first finds from the Mauryan times. From the Gupta period the team has found a residential complex with burnt brick walls and a burnt brick floor — a rare find in eastern India. A hearth measuring 1.5 metres with decorative tiles has revealed charred, rice and fish bones from the era. Ashes found by the ASI team suggest the area was engulfed by a huge fire in the post-Gupta period. There are also suggestions of repeated desertion and reoccupation. Peace and prosperity returned with the Palas. And there was a certain amount of stability even under the Sultanate. The Arabic script on coins show they were issued by Sultan Jalal al-din Muhammad Shah and Sultan Nasir al-din Mahmud Shah between 1418 and 1438.